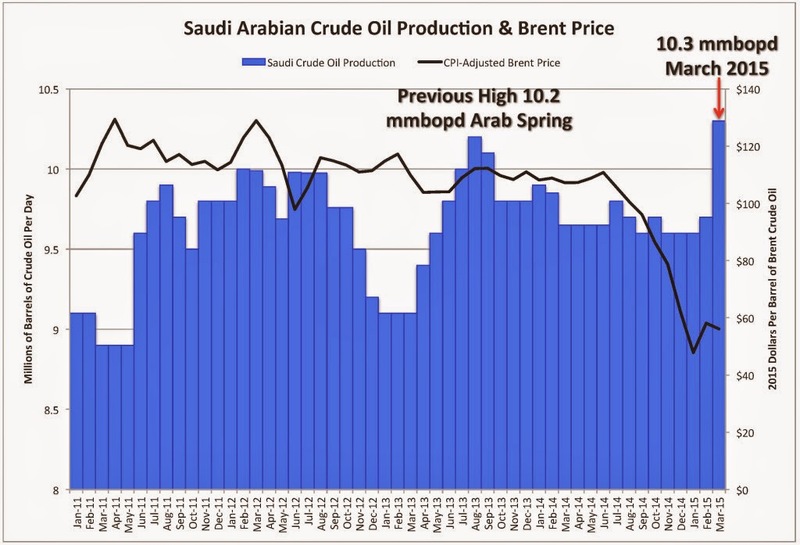 When the collapse of the oil prices started, in the summer of 2014, everyone noticed that Saudi Arabia was not playing their traditional role of "swing producers", that is varying their production in such a way to maintain reasonably constant prices. Facing a slump in demand, they should have reduced production; but they didn't. Initially, I thought the Saudis were simply taken by surprise and they were slow to react. But now, with the recent increase in Saudi production, it is clear that they have something in mind. Maybe they haven't engineered the market collapse, but in some way they are riding it. Though this be madness, yet there is method in it. But what method could there be in raising production just when prices are lowest? Every single textbook in economics will tell you that the market should adapt to changes in demand and offer in exactly the opposite way: facing a reduced demand, production should go down, too. Of course, as we all know, what you read in textbooks of economics has little to do with the real world. And, in the real world, there is a well known market strategy that consists in bankrupting your competitors by selling below cost. The idea is to create a monopoly and recoup later what the winner of the struggle has lost at the beginning. It is, of course, illegal, but the very fact that there are laws against it, means that it is done. However, there is a little problem in applying this strategy to the oil market. It has to do with the fact that oil is a finite resource. So, if producers manage to obtain a monopoly, that means they will run out of the resource before the others. Imagine you are an art dealer: would you sell your Picassos at low cost in order to undercut the other art merchants and gain a monopoly? Of course not, what you would obtain is simply to run out fast of your precious Picasso paintings and then leave the market fully open to the others. So, what are the Saudis doing, exactly? Art Berman suggests that they are fighting against the banks that created the tight oil bubble possible. After the elimination of the bubble, the market might return to relatively high oil prices and maximize the revenues for Saudi Aramco. Berman's interpretation is surely possible, but, as in all these cases, we are looking at governments as if they were "black boxes", trying to understand the inner mechanisms that make them move. This is very risky: just as we see in clouds faces that aren't there, we may see in a government's actions a plan that is not there. Are the Saudis really planning for a long term profit? Or are they simply misjudging the extent of their resources? After all, we have several examples of non-renewable resources having been managed as if they were infinite. Just consider how the North Sea oil was extracted at the highest possible rate when the oil market was experiencing historically low prices. That left producers with declining oil fields when market prices started increasing. It was not a very smart strategy, to say the least. In the case of the North sea, there was no long term planning; it was just that the long term depletion problem was not understood. 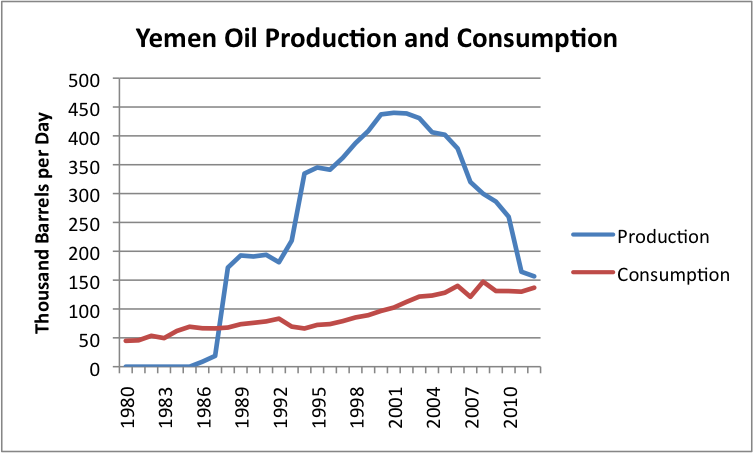 So, are the Saudis blind to the very concept of "depletion"? (*) That's impossible to say at present. The only certain fact is that age of cheap oil is gone; even though some wild oscillations may make us believe that the good times have returned - but just for a while. Yes Anon, "Their budget is the state is under pressure and they need money right away". (Google Translate) No more of an answer that they are doing the Red Queen Dance and have to pay bills is needed to explain what they are doing. King Abdullah of Saudi Arabia died at age 90 in January 2015. The new powers on and behind the throne In Saudi-land now need to consolidate power and need to borrow from Peter to pay Paul as low low prices took a bite out of revenues. Walmart in the form of Russia has come to town. Before Amazon drives a bookstore out of business a brick and mortar store might lower prices to keep going a little while longer. It may be over-thinking it to expect any more that for an explanation of what the Saudis are doing. Bills must be paid and the Saudi-land equivalent of going out of business is a revolution. A for more unpleasant experience than locking the doors of a small business and walking away. Most of those in power anywhere have no problem squandering the inheritance of future generations to maintain their position. Are their any rulers anywhere living now that have produced a legacy which would put them in history books as enlightened servants of the people and great men or women of our age? I think not; and certainly not in Saudi-land. Is their an Italian equivalent of to borrow from Peter so as to pay Paul? The second 'their' is supposed to be 'there'. It happens. There is another set of assumptions for which the Saudi behavior is perfectly rational: that demand will keep falling faster than supply, so the price will keep going down, and therefore the price that they can get now is as high as they will ever get, so they might as well sell as much as they can at this price before they're forced to sell at an even lower price. Whether that actually occurs remains to be seen, and they may not be what they are thinking, but it certainly would explain what they are doing. Your explanation makes sense and it suggests that the Saudis see peak oil as an affordability problem, not a supply problem. That’s also the position of retired actuary Gail Tverberg. The last oil price spike demonstrated that although technology can bring more oil on line, it probably won’t be affordable. For them the top oil price of 2015 is $75, we are at $58, so the market still has upward potential. From that data there is no need to overproduce at that high level. The argument reminas perfectly valid but the time frame has no exact match. I was thinking, maybe they are all scared of Elon Musk and his new battery! Perhaps they need the money, so must sell at whatever price will meet THEIR budgetary demand. Intervening in Yemen will not be cheap! About monopolies, you wrote: "The idea is to create a monopoly and recoup later what the winner of the struggle has lost at the beginning," and that this is "of course, illegal." But there's nothing illegal about doing this in international oil markets, is there? I've never heard of the WTO, for example, getting involved in trying to regulate international oil sales. - What is the outcome for Saudi oil income in the medium term if it obeys economists' 'logic' and cuts production to restore prices to ~$100/bbl, ceding that market share to the USA ? Besides many other countries evaluating their frackable resources, there are also the rising prospects of both in-situ Coal-seam Gasification-for-Liquids (using the world's vast 'uneconomic' coal reserves without mining) and of Gas-to-Liquids (using the far more immense seabed methane hydrates resource). Currently neither is nearer to commercial viability than fracked gas and oil were in say 2004, when ASPO discounted their relevance. So if Saudi doesn't maintain/raise its production to wreck the US bid to sieze a chunk of 'its' market share for the duration of US fracable and EOR-able reserves, what other country will it stand up to ? Japan ? Colombia ? Malta ? And just how many new entrants to the oil market with uneconomic coal-reserves and/or marine-commercial-rights-zones would there be ? If the Saudis' defensive output-strategy helps to gut the economic case for those ruinous new industries until rational global emissions control does so, through gritted teeth I'd wish them the best of luck. I think it depends on the time scale. If it is very short, then it is convenient to sell everything at any price. If it is very long, it is convenient to keep everything underground. In the middle, there has to be a tipping point, somewhere. I think the Saudis are simply on the side of selling fast. I'd agree that the Saudis "are on the side of selling fast," but the question is, why ? There are the costs of bombing Yemen (negligible) occupying Bahrain (negligible) and maintaining bonuses to police & armed forces (minor) but these don't remotely justify an unchanged/raised oil output under a halved oil price. Besides having to maintain/raise output to crush the US fracking boom and so deter other nations' aspiration to similar booms, and also to deter investment by many nations in developing and cutting the costs of CSGL & MH-GL, Saudi Arabia also has a further potent consideration in view: namely the technological and regulatory threats to global oil combustion. - While EVs' sales are currently minor, inside 10 years they have potential for a significant market share, while electric bikes in China are heading for the 200 million mark at present. - Global regulation of FF emissions may look similarly nebulous at present, but in 10 years, with global food security impacted ? In this light there is actually a limited and declining window for the sale of oil, so just as long as prices are above costs the general motivation is to sell what can be produced. Surely to assume that the Saudi govt, or any other govt, is by default prone to the crass stupidty that Il Duce exemplified and is setting policy merely by short-termism, would be exactly the analysis-by-narrative that you object to ? The Saudis' may have raised production to cover military expenditures. But the fact that they did not lower production sounds more suspicious of trying to make it hard on their up and comming competition, including the US Fracking boom. Keep the price too low and the frackers can not operate. Then, what, US investors pump money in to keep the fracking going. And it becomes a face off. Do the Saudis' (who one would assume are still making some profit) blink first and allow the price to rise, or does the Fracking industry run out of sources of money and collapse. And then what, The Saudis try to come in as a white night and support their fellow energy producers, with strings attached? Get the price of your competition down and then buy them out? But in a different perspective, we should remember there has been a change of leadership in the House of Saud. I recall reading on The Oildrum years ago, around 2007 in an article by Euan Mearns that after they started pumping water in depleting oilfields they lose the ability to regulate the rate at which an oilfield produces oil. Once started it's running downhill as long as they can! May be a part of the answer is not sophisticate. The Saudis are occupying Bahrain, fighting in Yemen and involved in Syria and Iraq. In the same time, they need give to their own “populace” more and more “panem et circenses” in order to avoid riots and springs. The possibility of a real war with Iran is not so far and a lot of their best assets are in private hands. Possibly, the government need cash now and here. I detect no decrease in world demand for oil. KSA began selling their oil at a discount at around the same time Rebels seized the capital of Yemen. I feel it is possible that at that time KSA decided it was required to sson invade/attack rebels in Yemen. Perhaps they feared the risk premium price hikes that would be topped onto 100/barrel oil if they invaded a neighbour so they decided to push the price down for a few months before they attacked. his way they could engage rebels in Yemen without the rish of creating 150/barrel oil and threatening the global economy. I feel the timing is suspicious. As I said, soon after rebels occupy the capital of Yemen the KSA begins selling at a discount and pushing down prices. I do not see a reduction in demand in the data that justifies this price reduction so it must be some other reason they began selling at a discount.